What happened to day four you ask? Well, I really did nothing of note, or at least nothing that was so significant that I wanted to blog about it. I went to this giant outside mall with a couple people from Germany where we shopped for shoes in about a hundred different little shoe stores, each selling the exactly same shoes. Then the rest of the day was spent arranging travel arrangements, picking up a few souvenirs, and finally watching “In The Name Of The Father” back at the hotel with an Australian, an Englishman, and an Irishman. We almost had the entire British Commonwealth covered. Amazing movie though, I wasn’t expecting to come all the way to Colombia to discover a new-found interest in the Northern Ireland conflict. 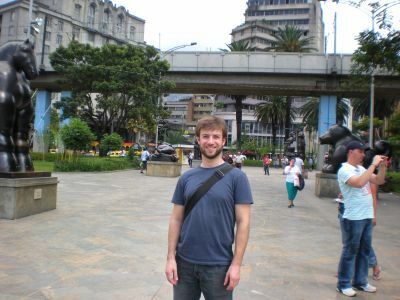 Anyways, after nearly everyone I met and spoke with (both in English and in broken Spanish) I took their advice and headed to Medellin. It really is true what everyone said, the people here are amazingly friendly and the weather really does feel like an everlasting spring. Too bad I only have a couple days here; I’m flying out to Cartagena and finally to the beach tonight. Time to start experiencing some sun again. 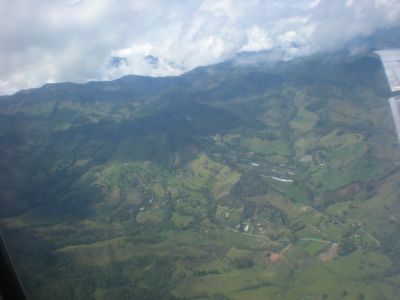 Here’s the view of the rolling green hills around Medellin. 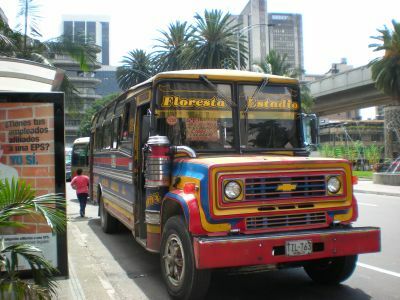 Medellin is known for their amazingly colorful buses (amongst other things). This trip is shaping up to have alot of Botero in it. 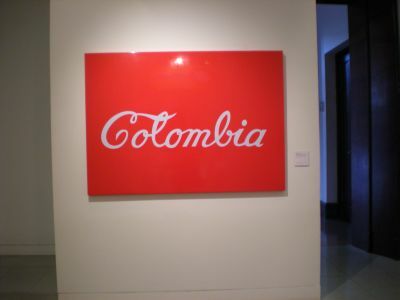 The Museo de Antioquia is definitely the best museum I’ve been to so far. 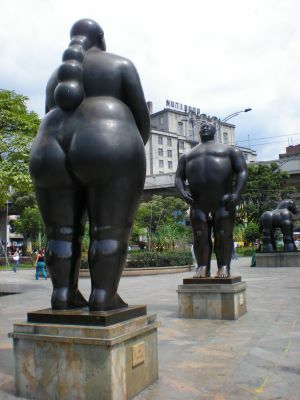 Out front is the Plazoleta de las Esculturas, which has about 20 giant Botero sculptures to see. Even better, even though being a Sunday, it felt like I had nearly the entire museum to myself (for only about US$2.50) where I saw everyone from Diego Rivera, Julian Schnabel, Botero, and perhaps one of Medellin’s most famous artists, Pedro nel Gómez.